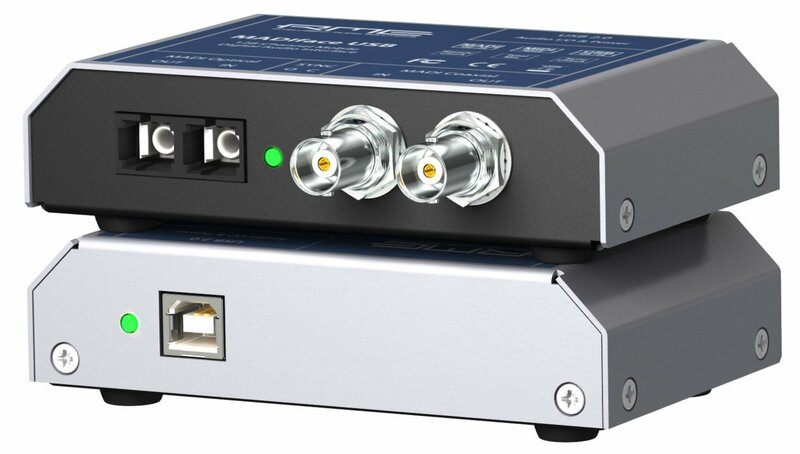 The compact RME MADIface USB provides MADI I/O over USB 2.0 while supporting the format's full 64 channels for recording and playback, under Mac and Windows. Both inputs can be used for full redundancy operation. Optionally both MADI I/Os can be operated simultaneously for full 128 channel input and output access, mixed and routed by TotalMix. Even without computer the small box delivers extraordinary bi-directional format converter and active repeater functionality. The option AutoSelect activates an automatic input selection. Using both inputs at the same time, AutoSelect puts the device into Seamless Redundancy mode. The MADI face USB will switch to the other input in real-time if the current one fails.